Oceania Cruises yesterday released a statement saying one of their ships, the ms NAUTICA, had been attacked by pirates in the Gulf of Aden. The incident occured at 09:28 Local Times, 05:28 GMT as the vessel, carrying British, American, Australian and Canadian passengers, made her way through the Maritime Safety Protection Area on a scheduled cruise. The statement said that the ship had sailed past several groups of non-hostile fishing vessels when two skiffs, approaching from a range of 1000 meters, tried to intercept the vessel's course. Evasive action was immediately implemented by Captain Jurica Brajcic and his officers, who 'took all prescribed precautions'. About 300 yards from the cruise ship eight rifle shots were aimed at NAUTICA from one of the hostile craft. This followed a successful attempt to outrun the attackers. 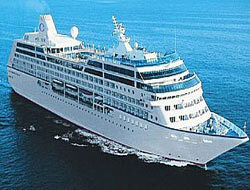 No-one aboard the cruise ship was harmed and no damage was sustained in the attack. The company said all guests and crew were safe. "All requisite international authorities have been notified and all anti-piracy precautions were in place prior to the event and all necessary measures were taken during the event." the statement concluded. It is not the first time a cruise ship has been attacked by hostile craft in the region. In November 2007, SEABOURN SPIRIT encountered pirates off Somalia, who lobbed grenades and fired machine-gun fire at the vessel, causing some damage to the vessel and injuring her Master-at-Arms, Michael Groves, who was repelling the attackers with a sonic device. Earlier this year, in April, the Le Ponant, a luxurious three masted cruise ship owned by French giant CMA CGM Group, was seized in the Gulf of Aden by pirates from Somalia. The pirates demanded a ransom for the safe return of the mainly French crew but French generals said that marine commandos recovered most of this during a raid on Friday 11th April when six of the pirates were captured.